I bought the BBF1 Meal Worm Feeder about two years ago, and it is simply the best meal worm feeder on the market. 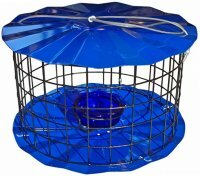 The wire openings allow bluebirds and small birds inside, but keeps the "hogs" starlings and other large birds out. The feeder can hold five or more bluebirds at one time, if needed, and a large amount of meal worms, either freeze dried or alive. If you chose to feed live worms, they cannot climb or crawl out of the blue dish, they stay where you put them. I have been feeding Bluebirds for more than fifteen years, and this is by far the best feeder I have found for feeding mealworms to them.